As we approach the end of January, like most people, your New Year’s Resolutions have fallen by the way side. January 20th is the day most people tend to cave and give into temptation, resorting back to their old behavioral patterns. We have good intentions; however, the idea of designating a specific date and time to go cold turkey on an emotional crutch is preposterous. This is an equation for failure if you ask me. So instead of sulking and showering yourself with disappointment, let’s try another approach. Call up some vampire-loving friends, dust off the martini glasses, get out the candles and open bar! If you have to justify it with a holiday, Valentine’s Day is rearing its ugly head around the corner and not everyone is keen on the idea of spending it gushing over a current or potential love interest. To make the evening more fun make sure to say vampire attire is a mandatory. The vampire theme is entertaining, distinctive and will be just what the doctor ordered for a fun filled night of bloody bedlam. 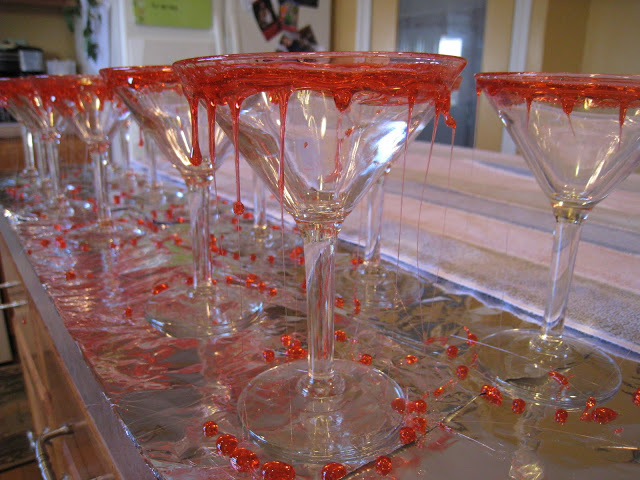 To make your party a hit try our top recommended Vampire Drinks! Rim the glass with red sugar (use food coloring) or drop in a set of wax vampire teeth for a real surprise. Pour vodka and half of the Chambord in a martini glass. Pour the remaining Chambord over the back of a spoon to make it float. Combine ingredients in a mixer and either shake or stir. Mix well. Serve over chipped ice in a highball glass. If mixed right it should be abouth [sic] the collor [sic] of blood. Pour the vodka and black raspberry liqueur into a cocktail shaker with ice. Combine Ketel One Citroen, ginger liqueur, grape juice and blackberry syrup to a cocktail shaker full of ice. Garnish with two blackberries or raspberries. Mix all ingredients in martini shaker with ice. Squeeze blood orange and lime wedge. Shake vigorously for 15 seconds and pour into chilled martini glass. Garnish with pomegranate seeds and sugar coated blood orange slice. Next article Vampire Picture Mystery—Solved! Can You Get a Masters Degree in Vampire Studies? I can’t wait to try some of these Erin. Fantastic post Hun. I am going to show my daughter as she mixes cocktails like a pro.